Savage yet beautiful, tough yet graceful, Sokojikara's "Kodama" Katana is a wild animal in the trappings of a shogun. 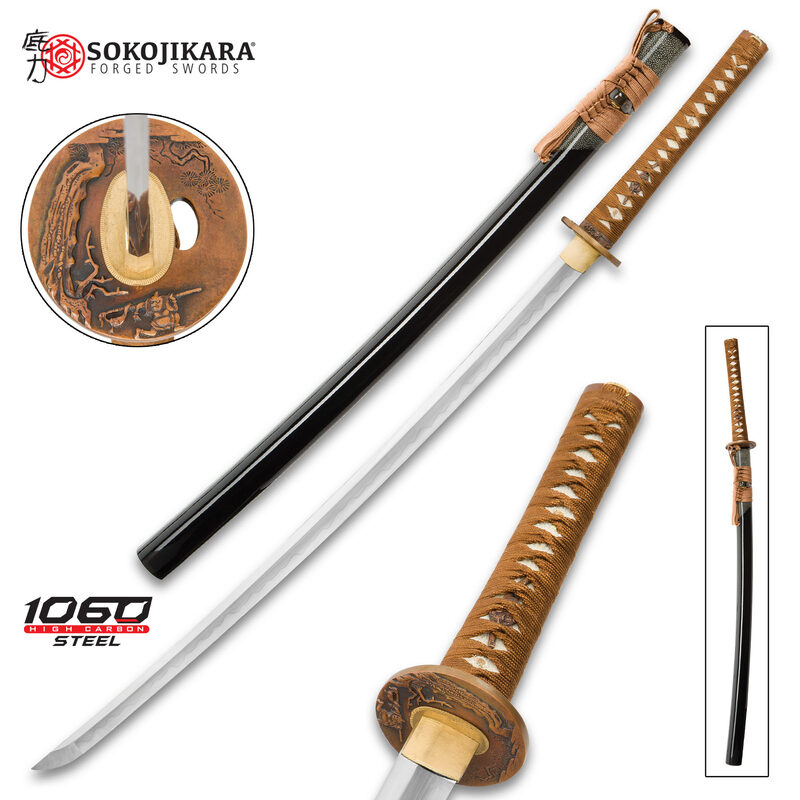 Sokojikara developed this distinctive traditional Japanese samurai weapon with today’s serious swordsman in mind. Master smiths painstakingly hand forge every blade, and seasoned sword artisans expertly handcraft the tsuka and saya. From vigorously hammering the raw, molten steel to gingerly tapping in each wooden mekugi, every step in the Kodama's construction receives the utmost care and precise attention to detail. Some of the world's - and history's - most revered techniques are employed, and every material is top-of-the-line. Add chic aesthetics and sophisticated appointments, and you've got a sword destined to be a legend. 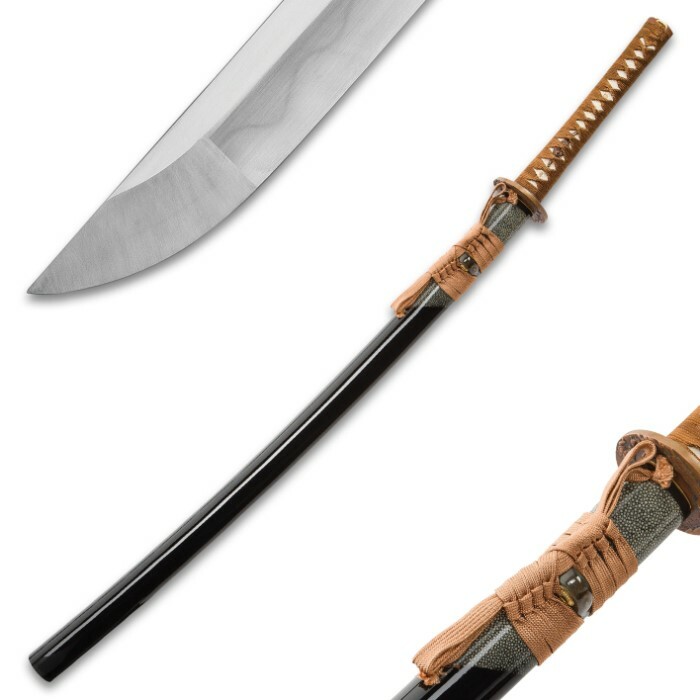 The Kodama's blade is hand forged from 1060 - one of the most sought-after high carbon steels - and 1060 alone would yield a blade with a nasty bite. But the Kodama takes it a step further, enhancing the blade with a time honored differential hardening technique called clay tempering. 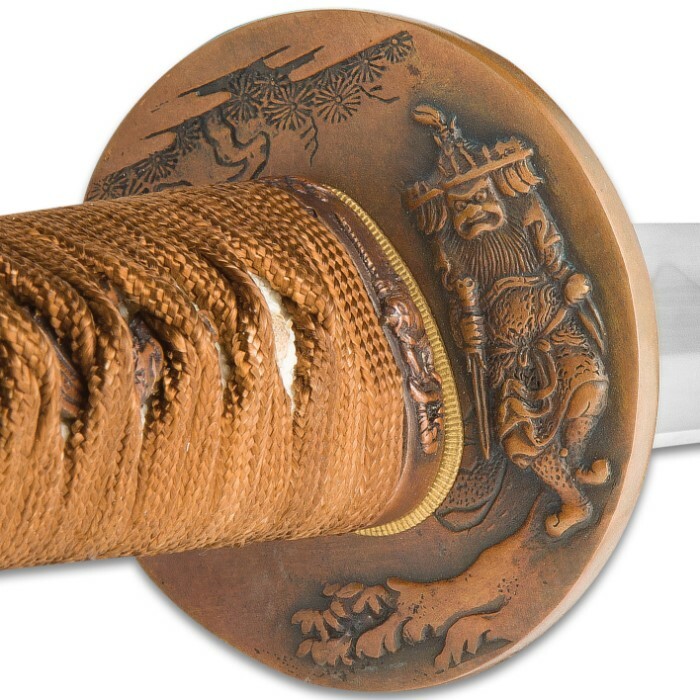 Unique to traditional Japanese swordcraft, clay tempering was developed centuries ago by Edo-period smiths and is integral to the katana's longstanding, well-earned reputation as the sharpest sword on earth. Clay tempering also imparts edge retention that's simply without equal. The Kodama's clay tempered tanto blade glides through rolled bamboo tatami mats and even cinder blocks like a koi through a still pond, suffering neither crack nor fissure, all-the-while retaining its razor sharp edge. Try that with an ordinary, non-tempered blade! It’ll almost certainly result in a dulled and/or chipped edge and perhaps even a cracked blade spine or worse. Clay tempering is due much of the credit for the Kodama's ability to withstand such punishing cutting trials. The tempering process is conceptually simple, but in practice it requires great skill and many years of grueling experience. 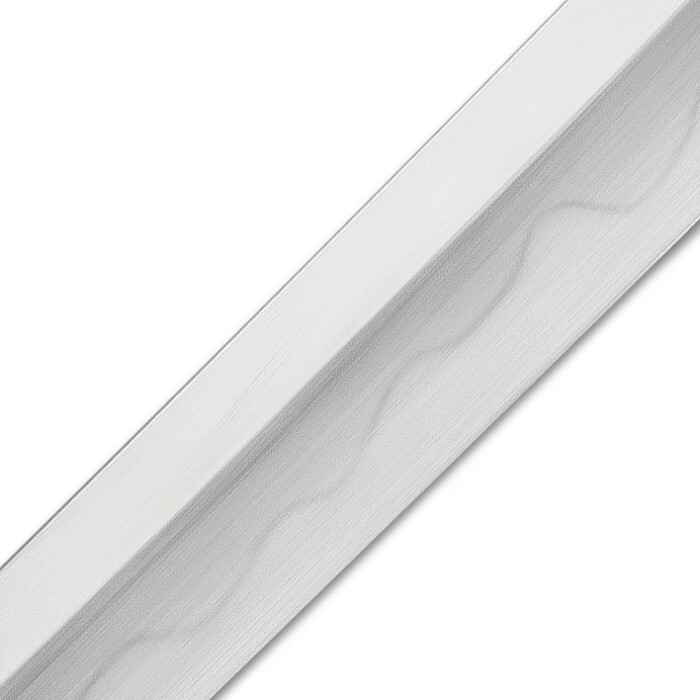 Prior to the intense heat of the hardening phase, Sokojikara's expert swordsmiths coat the newly formed, unrefined blade with clay - a thin layer along the edge, a thicker layer on the body and spine. When the blade emerges from the hardening forge, the clay layers' contrasting thicknesses cause the steel to cool at slightly different rates, yielding two distinct hardness regions. The edge cools faster, making it harder for edge retention and shear strength. The body and spine cool more slowly, rendering it "tougher"- less brittle, more flexible and better equipped to absorb impact energy. Impeccably balanced, the Kodama's weight is shrewdly distributed for improved control and agility, quicker response, as well as maximum power from every swing. 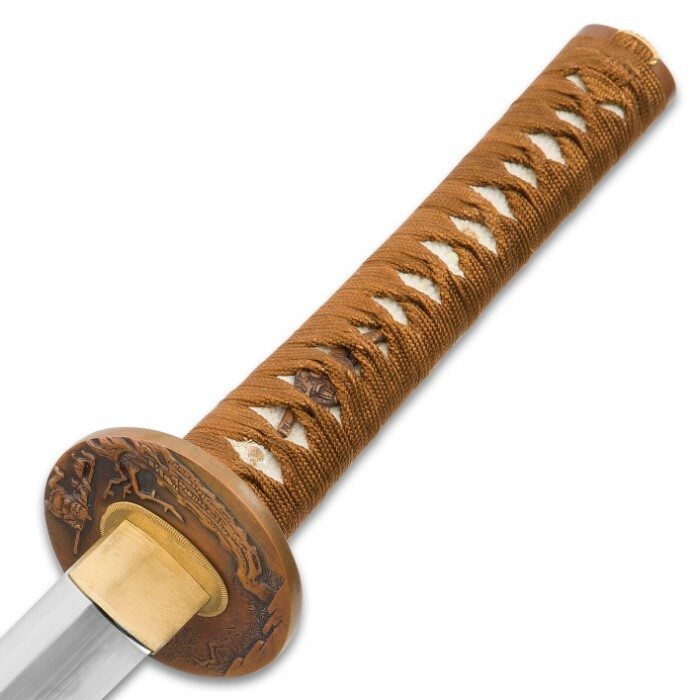 The delicately textured genuine ray skin same and soft braided ito that cloak the tsuka afford a comfortable, no-slip grip, further enhancing the sword's superb feel. 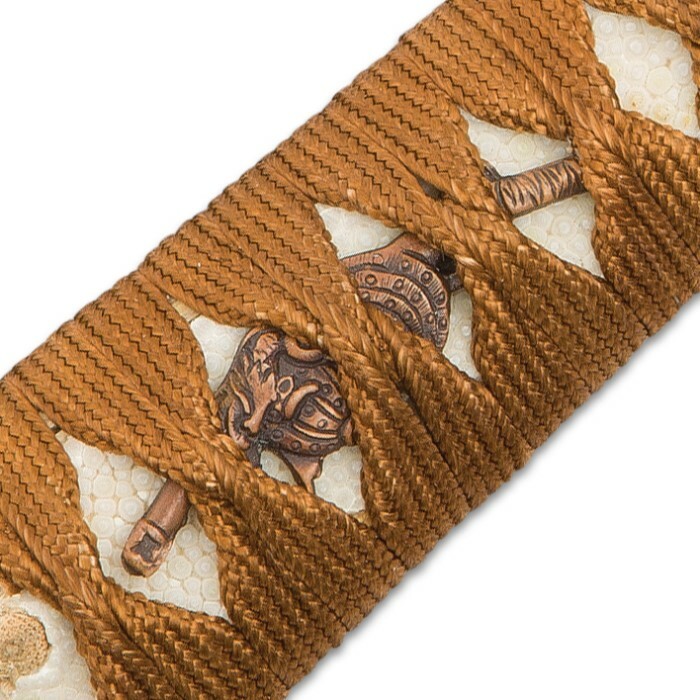 Expertly cast from bronze and embellished with breathtaking reliefs, the tsuba guards the hand, while conferring rich, earthy charm. 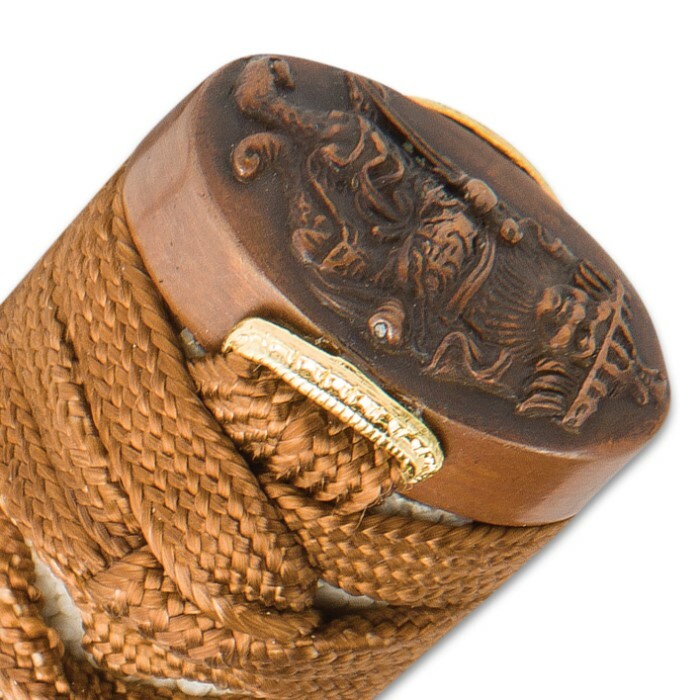 Nestled between ito and ray skin same, the bronze menuki exquisitely complements the like-finished tsuba and kashira. The Kodama has proven itself time and again, and it holds its own against any of today's most expensive katana, outperforming many. But the old cliché is true - "action" does indeed "speak louder than words," and at this unbeatable, downright unheard of price, why deny yourself the opportunity to experience Sokojikara's Kodama Katana for yourself? No matter how you use it, with proper care you can enjoy it for a lifetime. Then pass it down to your children, grandchildren or great-grandchildren! The Kodama is heirloom-quality and built to be treasured by generations of your descendants - your legacy preserved in hand forged steel. High Quality finish' very clean. The blade I received is T-10 blade..? I like it better than the 1060 as advertised, the T-10 is tough as nails and fits this package perfectly. The silk carry bag is high quality, attractive brocade. Absolutely worth every cent at this reduced price!! A beautiful sword, not just a collectors item but also a battle ready monster you cannot get better quality for this price. A must Have.